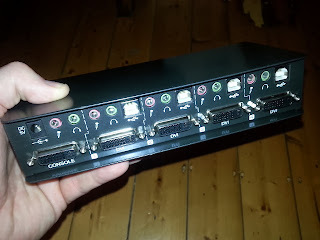 Given my computers seem to multiply for some reason, I started looking around for a KVM switch to help reduce the number of keyboard/mouse swaps needed. 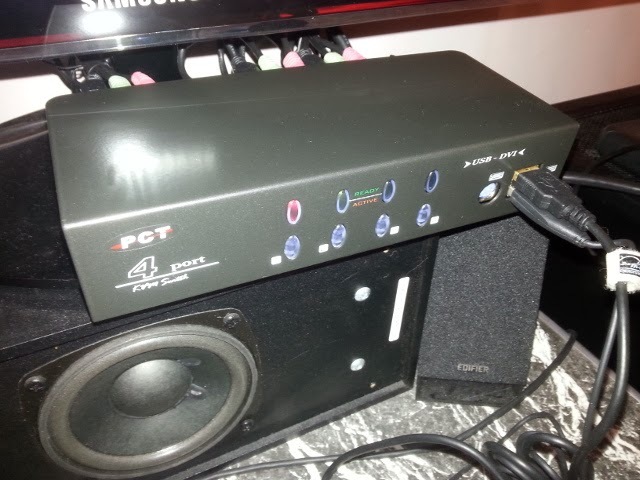 While a 4-port HDMI switch would have been nice, they are significantly more expensive, so I bought a PCT-MP4711 4-port DVI KVM for $90. (An Aten 2-port HDMI switch was available for $100, and while I've usually only got two computers active at any one time, sometimes there are...more). It is smaller than I assumed. I was kind of hoping it would be big enough to sit under a monitor (since it came in a hard case), but given its small size I wasn't comfortable with that. Some of the DVI screws were a little iffy. Would have preferred HDMI over DVI if the price was right. Screwing and unscrewing DVI cables is a pain compared to HDMI. 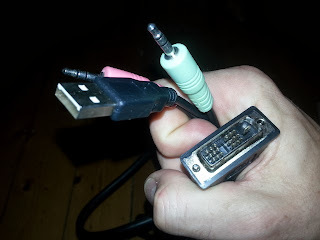 You need a "slim" DVI cable to fit in the "Console" slot at the back. Some DVI cables are a bit too fat to fit. Each time you press a button, it emits a really loud and annoying beep. Not sure if this can be turned off. When a machine boots up and powers down it sometimes emits three or four beeps in a row. Occasionally there is a weird delay in activating the mouse/keyboard after swapping between machines. My LED keyboard always remains powered when plugged into the KVM (have to turn off the illumination manually). I did once get it into a funny state where it thought it was connected to a machine that had been switched off, and wouldn't let me select the only machine that was still turned on. Pulling some of the cables out of the back reset it. Those are mostly negatives above, but in general I'm pretty happy with it and it works very nicely. It doesn't have a long warranty (only 1yr according to the sticker on the box), so I'll see how it goes after being used for a while. Update 1 March 2015: This KVM failed a few days after the 12 months warranty expired.